Zune Thoughts: Get 1,000 Free MP3s from Microsoft and ReverbNation! 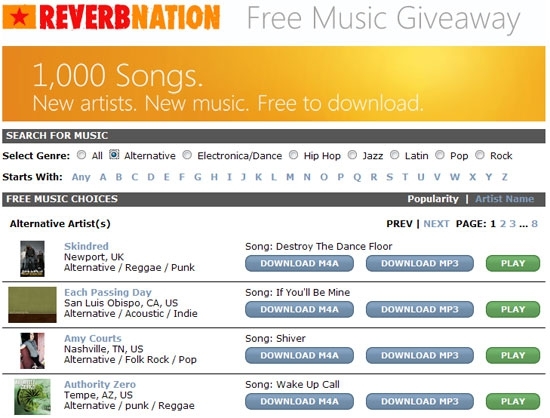 Get 1,000 Free MP3s from Microsoft and ReverbNation! "In partnership with ReverbNation, they're giving away more than 1,000 free MP3 / M4A audio tracks. The goodies are all available at www.reverbnation.com/windows, and unlike a lot of massive audio giveaways there are plenty of good tracks to be had. I was excited to find tracks from Skindred, Bif Naked, Fishbone, and Reverend Horton Heat (among others). While my taste in music might not jive with yours, don't fret - there's plenty to choose from. You can view the whole catalog or browse by genre - Alternative, Electronic/Dance, Hip Hop, Jazz, Latin, Pop, and Rock." Check it out: there's a bunch of really cool, free MP3s and M4As for your downloading pleasure. If you find something you particularly enjoy, let us know in the comments! Sven Johannsen: I don't own my music videos?? ?